The arrest of Merrill Newman on October 26 has been a great shock. It is tough enough to hear that the North Korean authorities took an 85-year-old into custody. But to make things even worse, they did it in a dramatic way—by escorting him off an airplane just about to leave Sunan airport for Beijing, which, on an ironic side note, suddenly appears like a beacon of freedom and a safe haven. What was the reason? So far, nobody seems to be willing to leak any details. We are therefore left to speculation and guesswork. What do we know about the specific case of Mr. Newman? Very little, actually. He is a citizen of the United States and a Korean War veteran. His relatives describe him as adventurous, whatever that means. He took a short tour organized by a company that is relatively new in the North Korean tourism market. He was about to leave when he got arrested literally at the last minute. No reason for his detention has yet been provided. That’s all. Our general information about travel to North Korea is slightly better. Rather than speculating about what Mr. Newman might have done or what the North Korean authorities might suspect him of having done, it makes more sense to look at previous experiences. These can serve as a guide for your own speculation, though at your own risk. Until we get an official statement from the North Koreans, the US government or from Mr. Newman himself, despite all the speculation, we actually know nothing. In addition to my own experience as a frequent traveler to North Korea I have had long talks with about 50 Western tourists who have gone there. Most of them knew what they were doing. They spent a significant amount of money for the trips and did not go to see the scenery. Westerners who travel to North Korea do so because they want to experience a system that is very different from that of their home countries. They do so with all kinds of negative images in their minds, and have been repeatedly warned about severe restrictions and regulations. Tourists going to North Korea always travel in groups. 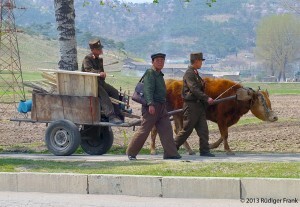 These can consist of as few as one tourist but always at least two North Korean guides and a driver. Tourist groups are treated very formally as a taep’yodan (delegation), each carrying a distinct code number such as yŏngguk 26 (England 26). No matter where a trip is booked, the local partner is usually Ryŏhaengsa, the state’s Korea International Travel Company. Upon arrival, one has to pass through immigration, collect baggage and then go through a customs inspection. The customs officers ask about foreign currency, Western publications, electronic devices, GPS systems, cameras, and mobile phones. Since January 2013, cell phones can be brought into North Korea and kept by the owner. They can be equipped with a heavily overpriced North Korean SIM card, available for rent at the airport. I have seen tourists using their own SIM cards in Kaesong standing on top of the central mountain. The guides noticed but did not interfere. However, it is strictly forbidden to leave such phones or other devices in the country upon departure. Materials such as leaflets and bibles that imply some kind of ideological activities are not welcomed either. Expensive professional cameras with large lenses can also trigger suspicions that a tourist is in fact a disguised journalist and therefore are not recommended. After customs, the group is greeted by guides who are always present until it departs. They stay with the group at the hotel even if they live in the same city and haven’t seen their family for weeks. In my experience, North Koreans and the authorities have a tendency to treat Western visitors with great suspicion, but also with respect and a sense of pride. They do their utmost to display their country in the best possible way, at least as they see it. The itineraries are pre-negotiated and consist of standard stops. These can be slightly shuffled or adjusted, but only within the constraints of what has officially been allowed. 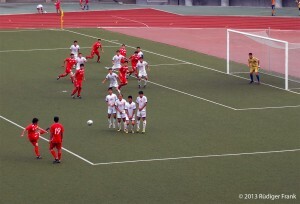 During my last trip, for example, some members of the group asked rather spontaneously to see a football match—and after a few phone calls, we were able to watch Myohyangsan play Kyongkongop (if you care: it was a draw). Very early during the trip, the guides will inform their group about the do’s and don’ts. Three issues dominate the rather long list of don’ts. Number one concerns the leaders: the late Kim Il Sung and Kim Jong Il, and the current leader Kim Jong Un. The worst thing a foreigner can do is to attack symbols of the leaders, like paintings or statues. Spraying them with colored paint, throwing dirt at them, kicking or trying to climb a statue and so forth are seen as absolutely unforgivable. 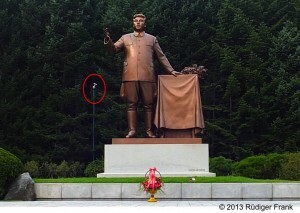 After rumors of planned attacks against the leaders’ statues emerged last year, surveillance cameras were installed around them throughout the country. The guides and guards around such holy places are on high alert when foreigners visit. Any breach of protocol is immediately noticed, intercepted, and punished. That can range from a serious scolding to angry shouting or, if the offense is really serious, arrest. In the many trips I have made to North Korea, I have never witnessed such an incident. Related to the above is the indecent treatment of images of the leaders in newspapers or journals. Printed materials should always be folded in a way as to not affect those images. Using paper with any of the leaders’ images for wrapping food or for other profane purposes is strictly forbidden. If one chooses to paint a mustache on an image of one of the leaders and then leave this piece of “art” in his hotel room upon departure, the reaction would be very harsh. The North Korean authorities’ sense of humor concerning such actions is very underdeveloped. It is like telling a US customs or security officer jokingly that you have a bomb in your bag. Bad idea. The second issue the guides address very early in a visit concerns photos. Although some travelers like to brag about their alleged heroism in taking photos “secretly,” I found this to be least problematic especially in the age of digital cameras, where images deemed inappropriate can be checked and deleted instantly. Tourists are not supposed to take photos of military personnel, which is, however, almost impossible in a country full of uniforms. Military equipment or installations are clearly off limits unless explicitly allowed, for example, during parades. Photos that show the country in a disadvantageous way—such as people sitting on the ground or garbage of any kind—are forbidden. During one of my recent trips, our guides got a phone call from the security authorities informing them that one member of our group had been observed taking a “bad” photo. The incident supposedly happened three hours before. The atmosphere suddenly got very icy. All cameras were checked, but as soon as it was over with no nasty image found, everything went back to normal again. For the group, it was a useful reminder as to where we were. In reality, my experience is that such restrictions are implemented with a great deal of flexibility. Very often, the “minders” just look the other way. Of a more serious nature is so-called cropping, i.e. taking incomplete pictures of the leaders’ statues or images. This is strictly forbidden and will lead to the instant deletion of such photos. If you leave the country by train, a customs officer goes through your camera and deletes whatever he or she deems suspicious. The third issue concerns “wandering off,” in other words, doing what tourists do elsewhere around the world. You are not supposed to leave the hotel grounds and stroll through the city. If a tourist defies that rule, it won’t take long for him to be reported to the authorities, who will make sure to more or less kindly guide him back to his hotel. This will certainly involve some questioning, which takes place immediately after this hideous criminal act has been discovered. I know of a case from a few years ago when this happened to two diplomats from a European country who were clever enough to leave their passports in the hotel and wore jeans and t-shirts. Informal dress and no ID… it took a few hours before their claims to immunity could be verified. I should also say that throughout the years, I found many inconsistencies regarding the above rules. In 1991, it was absolutely forbidden to take pictures of oxen carts. Nowadays, nobody cares. In 2005, I stepped out of the Koryo Hotel and walked through the city for more than one hour, without being harassed except by a policeman who accepted my explanation in Korean that I was a foreign visitor free to walk around the city. When I was a student in Pyongyang in 1991, I took the subway and the trolleybuses regularly. And while your camera is checked carefully upon departure by train, in the last few years the authorities at the airport do not seem to care about cameras as long as they do not stay in the country. If a Western tourist breaks any of the above rules, intended or not, what would be the consequences? The first option is to resolve the problem internally within the group, i.e. by the guides. This is the preferred method as nobody likes trouble or the extra work that results from it. Occasionally, there is a tourist who chooses the path of continued disobedience, which elevates the problem to the next level. The result can be the premature end of the trip and an early involuntary departure. This outcome, along with the resulting financial and bureaucratic trouble is the worst that would typically happen to a Western visitor unless he commits the more hideous crime of violating images of the leaders. To be sure, the atmosphere in North Korea is quite an emotional challenge for Western visitors. After a few days, when the initial excitement is gone, many develop a sense of frustration and anger. A nice group, open-minded guides and even the right time of the year can have an impact. For example, I found that people become less easily frustrated if the scenery is green and the weather warm and sunny. 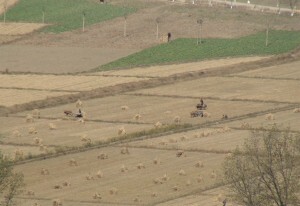 In late October, after the harvest, the fields are usually brown, which in combination with grey concrete buildings can create a more depressing mood. The duration of the trip matters, too. Most tourists are really ready to leave after six days. Depending on their personality, Westerners deal differently with the resulting inner pressure. Most make silly jokes, drink more than they usually would, and increasingly look forward to going home. Others start preaching the advantages of Western democracy and the need to change the current system in North Korea to their guides. I have seen this many times but never witnessed a resulting arrest. The known cases of severe treatment of tourists have so far mostly involved ethnic Korean citizens of South Korea, China or the United States. The extreme, very tragic case was the shooting of South Korean tourist Park Wang Ja by a security guard in Mt. 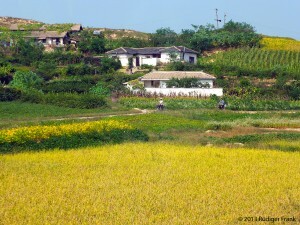 Kumgang in July 2008 which led to the end of hitherto flourishing touristic exchanges between the two Koreas. Others include the arrest of American journalists Euna Lee and Laura Ling who snuck into North Korea via China in March 2009, and most recently Kenneth Bae who was allegedly involved in religious activities and perhaps also in attempts to change the regime. In short, Western tourists are not arrested randomly in North Korea. If they are detained, it is usually in a very discrete manner. Escorting somebody out of an outbound airplane would have to be considered extraordinary and implies an offense that is regarded as very serious from the North Korean perspective. Moreover, some North Korean authorities care about their international image. Only a few months ago, Jo Song Gyu, director of the International Travel Company of the DPRK, announced through the state news agency KCNA, that tourism is set to become a strategic industry for the generation of foreign currency income. New destinations such as the Masik Pass ski resort and the improvement of domestic transportation are supposed to contribute to the goal of significantly increasing the number of incoming tourists, which now is about 6,000 Westerners and 30,000 Chinese per year. However, the detention of a Western tourist will undermine such grand ideas, to say the least. It is very unlikely the North Korean authorities would decide to keep an American tourist on their territory for symbolic reasons, in order to make a political statement of some kind. I have seen quite a few American citizens visiting North Korea and leaving unharmed, among them many with a past that could make them easily appear to be enemies of the North Korean state. The only recognizable special restriction American tourists receive is they are prohibited to travel back to Beijing by train. Rather, Americans must travel by plane, perhaps in order to make sure their baggage can be checked more thoroughly by the customs officers and their German shepherds who leave their dusty footprints on the airport’s conveyor belts. When I have taken the train from Pyongyang to Beijing, strangers have sometimes asked me to take a package along, but I naturally refused, as I would do anywhere in the world. It is also hard to see how a Western tourist’s detention could be interpreted as evidence that Kim Jong Un is losing his grip on the North Korean government, as some pundits have implied. When it comes to internal procedures and responsibilities in North Korea, our knowledge is very limited to say the least. Don’t forget that we do not even know the exact birthday of the current leader. As far as I understand, the Ministry of State Security would handle such an issue independently, perhaps in coordination with the Ministry of Foreign Affairs. The country’s leader would not be involved in the beginning, particularly if the person is just a tourist without diplomatic immunity. At some point, the top leadership is, of course, informed about the issue. In fact, the arrest of a foreigner is never done casually. Typical for a state security bureaucracy, involved personnel will not care about the international reaction, as it is none of their business. Rather, their priority is to make sure that they have properly followed all domestic regulations. The typical procedure would be that an arrested foreigner is held until the facts are sufficiently clear for the North Korean side, and only then a short announcement would be made on the state media and through diplomatic channels. This process can easily take a few weeks. Coming back to the case of Mr. Newman, the North Korean authorities were obviously keen to prevent him from leaving the country. My guess is that they wanted to interrogate him for some reason, which must be rather serious. The problem is that we don’t know why and therefore should be careful with speculation until we get more facts. This is as far as guesswork can and should take us. This article is based on my over 20 years of studying North Korea as a scholar, as well as my own experiences living in and traveling to that country. I have no information whatsoever beyond what has been published in the media on Mr. Newman, his motives or his actions. Nor do I mean to imply that Mr. Newman has or might have taken any of the actions discussed above that could create problems for Western visitors. This code number is usually not known to the group itself but serves as identification when passing through the numerous checkpoints in the North.